When it comes to mining stocks, the most frequent question I get asked is, “Why bother with the juniors when I can buy a large cap miner, instead?” That is a great question, and one that typically comes from investors who are new to the mining sector and only accustomed to purchasing large cap stocks (AAPL, GOOG, PG, JNJ, T, etc.). Penny stocks are super risky. Penny stocks are like buying lottery tickets. Penny stocks are scams and should be avoided. If the above viewpoint resonates with you, you’ll probably agree with me that over the last year or so, these junior mining “lottery tickets” were the bargain of a lifetime, and perhaps the single best investment anyone could have utilized to amass great wealth. In my own case, the “big boy” mining stocks are currently up 65%, but my Canadian juniors (trading on TSX, TSX-V) are up over 156%, by comparison… It is my own belief (based off of my own experience alone) that, yes, this type of delta between large cap and small cap can make a HUGE difference in the grand scheme of things and it’s something that we should definitely pay attention to. In other words, if I could do it all over again, I would have ONLY bought junior mining “penny stocks”. Unfortunately, that’s a very blind assumption to make… and it couldn’t be further from the truth. Since mining is the “bread and butter” and “lifeblood” of certain countries, such as Canada and Australia, naturally, these junior mining companies like to gravitate and set up shop there… So, if you’re a US investor and you want to buy the latest and greatest juniors, you’ll have to first catch them on the TSX, TSX-V, and ASX, before these companies can mature and grow enough to the point where they can eventually qualify and file for a NYSE listing. OK, so let’s assume all the above makes sense to you, and you decide that you are interested in buying up some junior mining stocks on their native exchange. The only problem is, you don’t yet have a global trading platform, but would still like a way to participate as a US investor. How can your purchase these foreign stocks without having to swap currencies and going through the hassle of having to get setup with a global trading account? Luckily, there exists something called the Over-the-Counter (OTC) market. Over-the-counter (OTC) is a security traded in some context other than on a formal exchange such as the NYSE, TSX, AMEX, etc. The phrase “over-the-counter” can be used to refer to stocks that trade via a dealer network as opposed to on a centralized exchange. It also refers to debt securities and other financial instruments such as derivatives, which are traded through a dealer network. In general, the reason for which a stock is traded over-the-counter is usually because the company is small, making it unable to meet exchange listing requirements. Also known as “unlisted stock”, these securities are traded by broker-dealers who negotiate directly with one another over computer networks and by phone. Oh boy, why does life have to be so complicated? As always, I believe that life can be broken down and made infinitely easier when we use a real-world example. Let’s suppose that I’ve been researching into lithium stocks and found a company, Critical Elements (CRE.V), that I’m interested in buying. CRE.V is a TSX-V listed stock. But like I mentioned above, let’s suppose that I’m a new US investor who wants to purchase shares using a US trading account, and let’s assume that I have no direct access to trading on the TSX-V. Doing a quick search, I can easily find that there is a OTC equivalent to CRE.V, trading under the symbol CRECF. Great, we have a match! CRECF is the OTC equivalent to CRE.V. In both instances, we are talking about the same Critical Elements company. Please note: If you ever have ANY doubts whatsoever, please take the time to contact the company directly yourselves to verify! In the example above, an investor should definitely contact Critical Elements FIRST and confirm that CRECF is in fact the correct OTC listing and the equivalent to CRE.V. Also make sure to double check with your broker! Quite frankly, the ONLY real way to know for certain that you are buying the right shares of the company that you are targeting is to point blank buy them on the native exchange. For myself, I much, much, much, prefer to trade these junior mining stocks on my global trading platform, conducting business on the native markets using their native currencies. Please do your own due diligence and research! 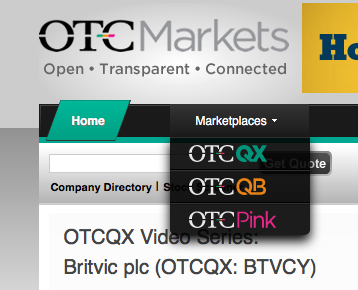 Moving on, we see that CRECF is listed on the OTCQX marketplace. As mentioned above, as long as we are matching the stock that we want with the right OTC listing, that’s just fine and dandy for me… We are on the right path. Since I know what stock I want to buy, next, I log onto my brokerage account and look at the price action on the OTC market. On a given day, here’s what CRECF might look like on Vanguard. Plugging in the ask to my trusty USD:CAD calculator, I find out the following. *Gasp*! If I was to purchase shares of CRECF on the OTC market at the ask price, I would end up paying an equivalent to C$0.697/share! Why on earth would I do that, when I can see that on the native market, shares of CRE.V are trading for just C$0.68/share?!? Well, the good news is, you don’t have to overpay! There are lots of brokers out there, but one that I’ve had good experiences with is Charles Schwab. If an investor has an account setup with Schwab, it’s very easy and painless to purchase OTC shares, without having to worry about things like bid/ask, volume, liquidity, etc. Here is today’s quote from Charles Schwab for CRECF. Notice the difference? Even though we are looking at the exact same CRECF OTC stock, on Charles Schwab, we see that the volume shows 67,075 shares traded (matching CRE.V volume on the TSX-V), whereas Vanguard showed ZERO. Charles Schwab is unique… What they do is that for any given OTC order, they will auto-route their online system to BOTH the OTC market and the native TSX-V market. In the above example, the ask of $0.5345/share is denominated in US dollars, but the bid/ask are coming from BOTH OTC and TSX-V.
Charles Schwab just makes buying OTC shares a whole lot easier for the US investor who want to purchase Canadian junior mining penny stocks (Australia is a bit trickier since ASX business hours do not coincide with NYSE; see Different Time Zone Example below for more details pertaining to after-hours OTC trading)… Keep in mind, not every broker out there will automate and provide the same type of service. Your mileage will vary, so ask lots of questions and don’t hesitate to try out different brokers before settling on the one that works best for your needs. But all is not lost if we don’t trade with Charles Schwab… Going back to the Vanguard example, whenever I see instances where the OTC market is illiquid (no volume), and the bid/ask spread too wide, what I simply do is phone in to customer service. Here’s a typical conversation I have with Vanguard (using CRECF as an example). Even with the $57 mark up from Vanguard, my total cost basis usually still comes out more favorably, using the block desk to trade in Toronto as opposed to trading on the OTC directly. Again, for penny stocks like Critical Elements, there is usually very little volume of CRECF being traded on any given day… And especially if I’m trying to fill a large order (for me that’s like 50,000+ shares per transaction), I know that I’ll have much better luck hitting my limit price (and quota) utilizing the native exchange route, in this case, buying shares of CRE.V on the TSX-V. Since we are conducting an order on the TSX-V, Vanguard has to perform currency swaps on the way in to purchase, and back on the way out, going from USD -> CAD back to CAD -> USD. However, we just have to let them handle that… There’s no extra work that we need to do ourselves… All the currency swaps back and forth are accounted for and bundled in with that $57 service fee, as well. On the way back out, you will own shares of CRECF… even though you really did just buy shares of CRE.V on the TSX-V.
And for record keeping? From my experience, it seems as though the volume transacted remains on the native exchange. In other words, even though I ultimately ended up owning shares of CRECF, when I look through the day’s transactions, I’m unable to locate my volume/order looking at the CRECF daily trading chart. Bottom line — I end up purchasing (owning) shares of the company that I want! Here’s another example for you… Let’s suppose that I want to purchase shares of Birimian Gold (BGS.AX), an Australian listed gold/lithium stock. 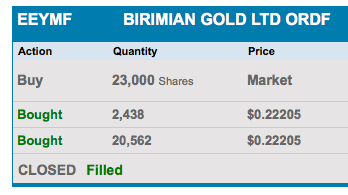 Again, let’s assume that I don’t have access to a global trading platform, so will need to resort to buying shares of EEYMF, the OTC listing for Birimian Gold. Logging back into Vanguard, I might find the following for EEYMF. Hmm, that looks like some seriously sketchy sh!t right there, no? So, what do I do? I phone up Vanguard again and I ask them to break it all down for me… Most importantly (and first and foremost), I make sure to confirm that without a shadow of a doubt, the US OTC listing for Birimian Gold is indeed EEYMF, and that it is in fact 100% correlated (and exchangeable) for shares of BGS.AX. Once I get the green light signal, I let Vanguard know that I’m interested in purchasing shares of EEYMF, directly on the Australian exchange, again for liquidity purposes. However, this time around, they are quick to inform me that the Australian exchange doesn’t open until 5:00 PM PST, and the Vanguard offices (block desk) closes around 4:30 PM PST. Vanguard informs me that, “When there’s a will, there’s a way.” In other words, I can put in a limit order in advance if I’d like, and when the Australian market opens up for business, my order will be in and good for the day. All I have to do is give Vanguard a limit price, let them know how many shares I want to buy, and they’ll put in the day order for me. By US market open the next business day, I’ll know whether or not my order for shares of Birimian Gold went through or not. Again, even though on the way out, I’ll end up with shares of EEYMF, for all intents and purposes, the entire transaction was handled on the native Australian market. In my case, I ended up placing the order with Charles Schwab, and not Vanguard because I have a global trading account linked with Charles Schwab and wanted to convert the shares of EEYMF to BGS.AX. Also, Charles Schwab’s offices are open during ASX hours, so it makes it far easier working though a live operator than having to rely on Vanguard’s advance order that is preset and “good for the day”. I’m not trying to ramble on with the details… But my point is basically this — Whether you buy shares of EEYMF or BGS.AX, it’s the EXACT SAME THING. As long as you are buying shares of Birimian Gold, it doesn’t matter on what market you buy them from… The shares are INTERCHANGEABLE. Because the shares are interchangeable, what I always like to suggest to anyone getting started in junior mining stocks is this — Ignore the OTC price action! Stop paying attention to it. All the REAL price action, volume, movement, etc. all happens on the native exchange. Sure, I occasionally use the OTC platform to buy/sell shares, but 90% of the time, even when I do that, I’m going through some kind of block desk and routing my order directly to the native exchange, anyway. So, why bother looking at a low volume price chart that will never give you a true representation of what your shares are really doing?!? Here’s a perfect example of that. Altura Mining (AJM.AX). The following shows the REAL price action of Altura Mining. Here’s the OTC listing, ALTAF. 7.05 million shares traded on ASX. 1,000 shares traded on OTC. Yes, shares of Altura Mining were in fact down for the day, dropping -6.38%. AJM.AX is the ONLY indicator you should be looking at for Altura Mining. Don’t bother wasting your time looking at OTC prices! Did I mention lagging indicator? Just at the pathetic price history of ALTAF… Shares aren’t even traded everyday! That tells you all that you need to know about using ALTAF as a price indicator. As was outlined in the article, when the day comes and you need to liquidate shares of ALTAF, just call your broker and ask them to connect you to their global block desk. Unless you’re dealing with a broker like Vanguard that closes up shop before the ASX opens… In that case, you’ll need to follow the Birimian Gold example and tell them to setup a limit order in advance for you. If all goes well, your transaction should go through during ASX business hours, and you’ll wake up the next morning, log in to your brokerage account, and find proceeds from your sale order of ALTAF. Man, this was a long article… But since I get questions regarding OTC shares every other day (almost), this will probably rank up there as the most useful (important) article that I’ve written all year. Are there any brokerage fees to trade stocks in OTC via charles schwab ? I tried and i had around $50+ fee. Wanted your opinion on it. Yes, there are standard brokerage fees, no different than with any other platform. I forget the exact fees/commission break down, but it’s pretty reasonable with Charles Schwab, unlike with Vanguard with their $57 fee to use their block desk. Now that hurts a lot, so I try to minimize using Vanguard to buy OTC shares. I just went through my history and I’m seeing $6.95 USD for auto-routing, buying OTC shares that trade in Canada (in other words a market that coincides with OTC hours of operation). For off-hours, I purchased shares of EEYMF (during ASX hours of operation) with help from Schwab representative (not online) and the fee was $24.00 USD, with the intent that I would transfer shares into my Schwab global trading account after transaction settlement. I am incuring a $50 foreign transaction fee. Now sure how you were able to get past it ? You would have to talk to Schwab about that… Perhaps it’s b/c I also have a global trading account with them… Is it possible for you to open one up? 1% currency conversion fee + mark up per share, I think C$0.003/share in Canada, I forget for Australia. In any case, the fees do add up, so trading in and out of positions is probably not ideal… Personally, I try and avoid it as much as possible. Another fantastic article. Thanks! Enjoy your time in Hong Kong! Thanks! Very much looking forward to HK! I noticed the OTCMKTS:GALXF trades at significantly higher volume (today Vol / Avg. 432,122.00/149,002.00) than say OTCMKTS:CRECF (Vol / Avg. 0.00/28,632.00). Would this indicate that just purchasing GALXF on the OTC be equally favorable as getting it on the native market? Great article on how exactly this all works! I am pretty sure Schuab is the same for Individual accounts as Fidelity. I find it best to just purchase the shares on their foreign exchanges then when I sell out of them just keep a balance in CAD or AUD so you don’t get hit with the 1% currency exchange fee again. Especially with these tiny Nano Cap stocks its just much easier and I sleep better knowing I own the actual shares not a derivative of a share. I have a self directed HSA account with TDameritrade. Do you know it’s possible to do it there? Do you use your personal broker account to buy and sell? If that the case, there might be short term and long term capital gain tax on your account. I use Schwab, and what I was told by them at one time was that if shares are traded on TSX/TSXV, then there is a cost of half a cent per share for shares under a dollar, and a penny for shares over a dollar. Trading commission has gone down to $4.95 a trade, though they do have a group of ETFs where the commission is zero. …and the penny/ha’penny was in addition to the $4.95. They would trade on whatever the best rate was between that and the OTC. Next post: Gold – You Shall NOT Pass $1,300/oz!